One of the benefits of being a renter as opposed to being a homeowner is that the landlord is responsible for many costly home-improvement projects, like replacing a leaky roof or updating dying appliances. But not all domestic damage is his or her responsibility. What exactly are you on the hook for? Find out which home repairs are not your landlord's problem — and start saving up for them now. The landlord can't control how much you run the lights, so replacing bulbs when they burn out is your responsibility. The same may be true for replacing batteries where necessary, including those in smoke and CO2 detectors, which should be outlined in your lease so that there's no confusion about who's supposed to keep up with home safety. Many leases will also require tenants to replace air filters in HVAC systems on a regular basis (ideally every three months, but landlords often supply the filters). Here's what I've learned from personal experience: Don't put eggshells or potato skins in the garbage disposal if you don't know how to unclog the sink. Otherwise, it'll cost you a visit from the plumber, because this is definitely not your landlord's problem. Same goes for the toilet — you do the crime, you do the time. Unclog it yourself or call someone ASAP before the problem turns into more damage from overflowing water and other "stuff." Assuming that you're moving into a rental unit that doesn't have any existing vermin problems (you should verify this independently before signing a lease; don't just take the landlord's word for it), you may be responsible for any rodent or bug infestations that occur after you move in. Be sure to check the terms of your lease as well as any state-specific laws regarding pests such as bedbugs. Unless your landlord has agreed to handle the mowing and snow shoveling in the single-family home you're renting, you'll need to get out there yourself. While you can let the lawn go for a little while, you're legally required to have your sidewalk shoveled within a few hours after a snowstorm ceases. Fail to do it and you could face fines from the city, which also will be your responsibility. If you live in a multiunit dwelling, however, the landlord generally takes on this responsibility him or herself or hires someone to do it. Being a decent human being means taking responsibility for damage caused by your own negligence — accidental or not — and that of your family, friends, kids, and other guests you invite into the home. Your landlord is not responsible for anyone's carelessness; you can't punch holes in the walls during an argument and expect them to fix it. And please, don't lie to get out of whatever it is you or they did to damage the property. Be an adult, pay for the repairs, and move on (ideally with people who don't destroy things). One of the biggest costs to landlords is replacing carpet ruined over time by tenants. I've seen some of this damage myself, and I'm frankly baffled by how disrespectful some people are and the lengths they'll go to try to skirt the cost of cleaning or replacing the carpet. I once had a tenant who was not authorized to bring an animal into my shore rental, but did so anyway. When I questioned her about it, she denied it. I explained to her the strong smell of feline urine upstairs, at which point she revised her story to having a dog in the house briefly. I wasn't born yesterday, lady. The dog bit was a lie, too — but it didn't matter what kind of pet was in my house. It was unauthorized, and I passed the cleaning bill right along to her. You break it, you buy it — that's the rule with appliances in your rental that you've damaged. Whether you've caused a dryer fire from neglecting to clean out the lint trap, burned out motors from working appliances too hard, or caused the dishwasher to overflow because you thought laundry detergent would work in lieu of dishwashing liquid (shout-out to my ex-husband), it's all your responsibility. If any appliance just stops working, however, it's probably on your landlord — so give 'em a call. Before you can get your security deposit back, your landlord will want to make sure a few tasks are completed, including patching up holes you've put in the wall from frames, shelves, and other damage you may have caused to the drywall and paint from adhesives. Skip out on it and you can kiss your money goodbye. Read your lease closely before signing. 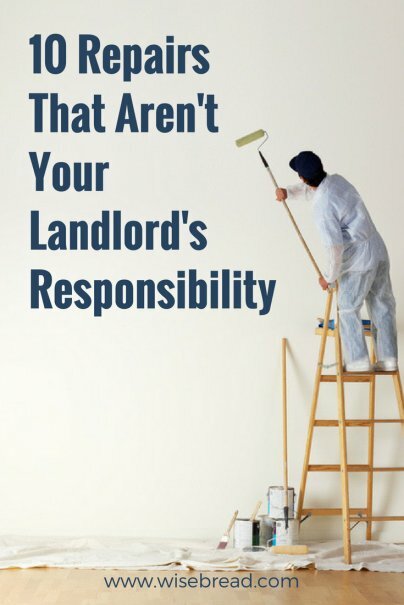 Most issues of landlord/tenant responsibility are outlined in the document. Keep it on hand to go over again if issues arise so you can quickly determine whether or not the burden and financial responsibility falls on you. Once your signature is on the lease, you're legally bound to it. If you feel like something outlined should be the landlord's responsibility, discuss it beforehand to revise if necessary. After that there's no wiggle room — it's either your problem, or not.